After waiting long enough, eventually the results of HP's acquisition of Palm to fruition. Just like the HP tablet touchpad, the two latest smartphone will come with a WebOS. We start with the successor Pre 2: HP Pre 3. This smartphone has a capacitive touch screen of 3.6 inch WVGA resolution 480x800 pixels large. 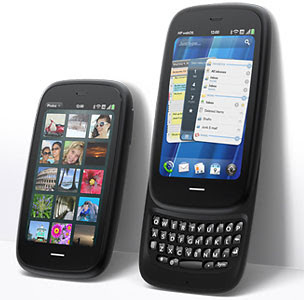 Similar to the BlackBerry Torch, it also comes with a Qwerty keypad slider at the bottom. HP Pre 3 has a 5 MP camera, complete with autofocus and LED flash. HP also added at 1.3 MP front camera for video calls needs. Eliminating the impression cheap phone, HP also provides Snapdragon 1.4 GHz processor and 512 MB of RAM memory. Connectivity is relatively standard. There are 3G HSDPA, 7.2 Mbps, HSUPA, 5.76 Mbps, EV-DO (if changed to a mode CDMA), Wi-Fi 802.11 b / g / n, Bluetooth 2.1 and microUSB 2.0. The rest, the phone has an accelerometer sensor, light sensor, GPS, and digital compass. Then HP Veer is the second new smartphone from HP. Similar to the palm Pre ? HP Veer also comes with a Qwerty keypad slider at the bottom. Only, HP Veer smaller and compact than HP's Pre 3. In addition, HP Web Veer also run OS 2.2. HP Veer offers capacitive touch screen without the frame at 2.6 inches, is equipped with multi-touch features and a resolution of 320 x 400 pixels, smaller than Pre 3. If you see a brief physical, HP Veer looks more robust. But, for performance, the processor is not as smartphones with Pre 3, only a 800 MHz Qualcomm Snapdragon 7230. HP Connectivity Veer equipped with HSPA +, Wi-Fi 802.11 b / g, Bluetooth 2.1 and microUSB 2.0. There is no CDMA network here. However, HP Veer has a 5 MP camera as well even without autofocus.